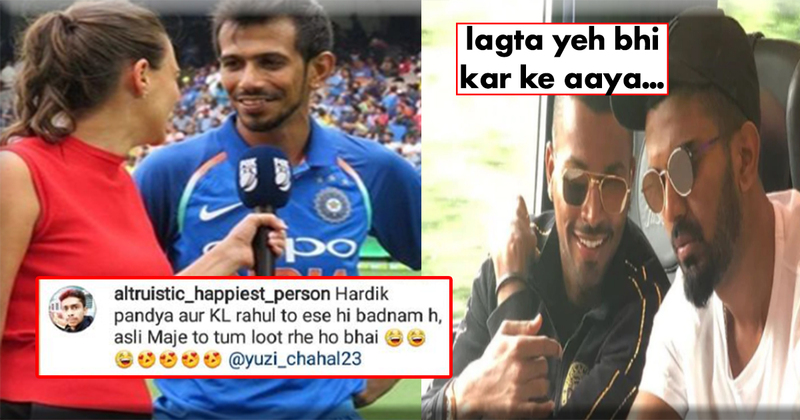 Yuzvendra Chahal gave the entire nation a reason to cheer after his career-best six for 42 set it up for a historic Indian win but he also gave social media users a big reason to laugh. The Indian leg-spinner took to Instagram and posted a picture with a female anchor after the 3rd ODI at MCG. Chahal can be seen as happy as he speaks with her. Fans had a ball reacting to it. Some felt the cricketer should stay away from all of this or he too, like Hardik Pandya and KL Rahul could land in trouble in the future, whereas some fans could not believe what they were seeing and hence commented in a more cheeky manner. Recently, Yuzi posted a picture on Instagram, where he is seen smiling and talking to a beautiful female anchor, who we assume is Australian. She has been tagged in the photo, and her name is Neroli Meadows. Yuzvendra deleted the picture on Instagram, after people begand teasing and trolling him, but it was too late. We have screenshots of some of the comments, and the picture even went viral on Twitter. Now this immediately triggered a number of fans. While some of them are comparing him to Hardik Pandya, some are cheering him on.